Among the surfers and beach-casting anglers, there’s a new visitor to San Francisco’s Ocean Beach shoreline. Benjamin McInroe is there for only one reason -- to find Pacific mole crabs, creatures commonly known as sand crabs. They are tiny animals whose burrowing causes millions of small bubbles to appear on the beach as the tide comes in and out. 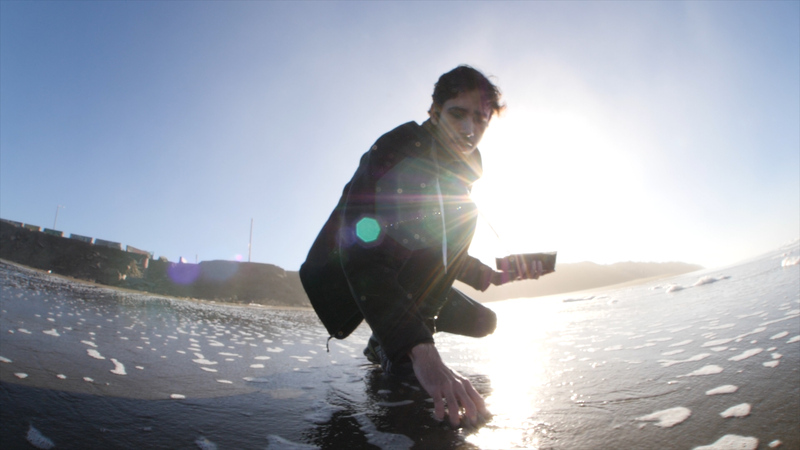 McInroe is a Ph.D. student in UC Berkeley's Poly-PEDAL Lab, where he studies biophysics. He wants to know what makes these little creatures so proficient at digging their way through the wet sand. McInroe hopes that he can one day copy their techniques to build a new generation of digging robots. Mole crabs are inch-long crustaceans that spend most of their lives buried just under the surface of the sand on beaches from Alaska to Baja, Mexico, as well as parts of South America. “They like to live in the swash zone,” McInroe explained, referring to the part of the beach where the waves break and flow up the shore. That’s where you’re most likely to find the little bubbling holes they leave in the sand after the waves recede. 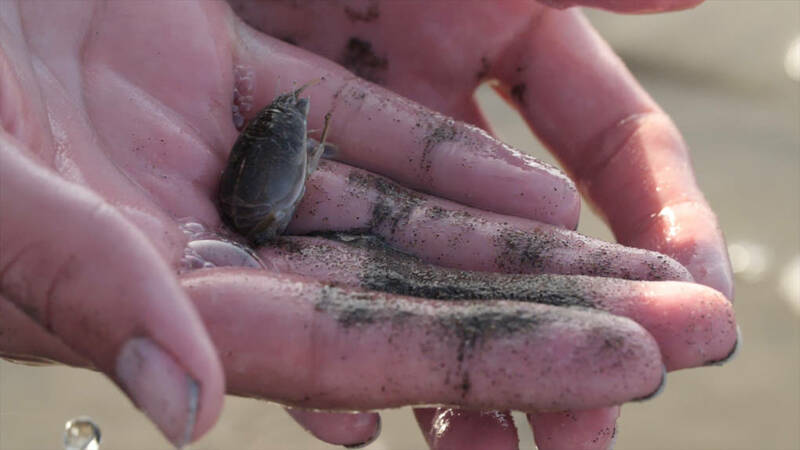 The daily movement of the tides means the swash zone is constantly moving up and down the shore, so mole crabs burrow to keep up with it and stay in the wet sand. Mole crabs prefer to stay submerged. Once a wave rolls in, they pop their stalked eyes and feathery antennae out of the sand and into the turbulent water to catch floating bits of kelp and other detritus kicked up by the waves. The tides move slowly, but that’s not the only challenge mole crabs face. The shoreline is full of hungry predators looking for a quick snack. “They need to hide from seagulls that want to eat them,” McInroe said. As a result, mole crabs have become masters of the quick escape, burrowing under the sand at astonishing speed. It’s this ability that has drawn McInroe's interest. But mole crabs dig too quickly for the human eye to observe their special techniques. So McInroe brings specimens back to Berkeley to test them in a laboratory. To get a look at what they do beneath the surface of the sand, he drops a mole crab into a special narrow aquarium that looks a bit like an oversized ant farm. This keeps the mole crabs near the glass when they dig. He then records the action using special cameras that slow down the movement, allowing McInroe to see exactly what make the mole crabs so fast. It turns out that mole crabs actually dig backward, using their pointy rumps to push past the sand grains. They vigorously beat the wet sand with their tails, whipping it into a semi-liquid state. “They make the sand into a slurry,” McInroe said. Then the mole crabs hand up the grains toward the surface, using their legs. A pair of modified legs at the front look like paddles. They're called uropods and they do a great job of moving sand. In both situations, the phenomenon is called liquefaction. It’s what allows mole crabs to spend their lives burrowing through heavy sand. McInroe said he hopes that by studying these master diggers, he might one day be able to use the information to create technology that mimics the mole crab’s technique. So next time you’re at the beach, keep an eye out for the little bubbling holes that mole crabs leave in the wet sand. There may be tiny engineers at work down there.